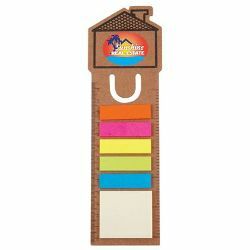 House shaped 13cm/5inch cardboard bookmark ruler with 1 block of repositional notepads with 15 leaves (45mmL x 40mmH) and 5 adhesive noteflags with 15 leaves per colour (Orange, Pink, Yellow, Green, Blue). ITEM SIZE(MM) 69L x 211H. PRINT AREA(MM) Up to Oval - 39L x 29H, Rectangular - 55L x 30H. LABEL SIZE (MM) Oval - 39L x 29H, Rectangular - 55L x 30H. COLOURS Natural, Assorted Colour Noteflags.